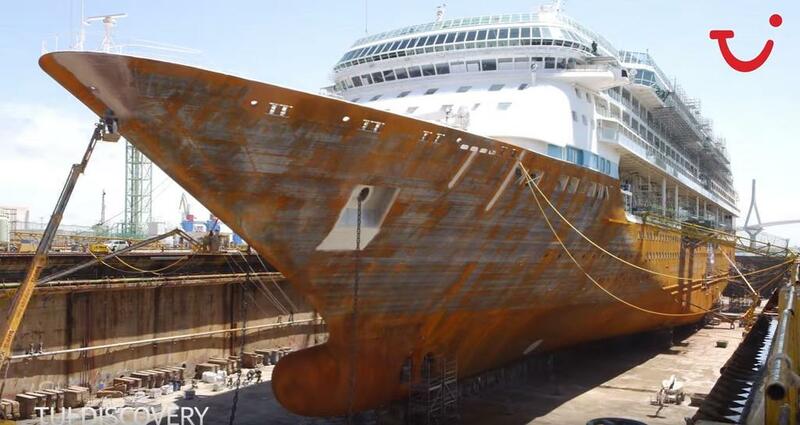 Thomson Cruises has posted one of the best dry dock videos of the year so far. Watch as Royal Caribbean’s Splendour of the Seas is transformed to the new TUI Discovery for British based cruise line Thomson Cruises. Back in early 2015 both cruise lines announced that Splendour of the Seas will be purchased by Thomson with the 69,100 gross ton vessel being transferred in 2016. Once Thomson Cruises took control of the vessel it went through a major multi million pound dry dock. The ship’s last voyage for Royal Caribbean was on April 4, 2016. You can take a look at the video below where the ship can be seen getting a huge makeover including a totally new paint job, upgrades externally and brand new features inside. The ship has been in dry dock since April and being refurbished for the British cruise market. The new look TUI discovery will sail its first cruise out of its new home port of Palma De Mallorca, Spain on June 11, 2016. The ship will sail Mediterranean cruises until it departs for Bridgetown, Barbados on October 29, 2016. The ship will spend the winter season there before returning back to Palma for Summer 2017. TUI Discovery will be carrying 1,830 passengers across 915 cabins and feature a rock climbing wall, outdoor movie screen and eight bars and lounges. Marella Cruises which was previously known as Thomson Cruises has announced details on its upcoming newly added cruise ship and that the entire fleet is going all inclusive. UK cruise line Thomson Cruises is rebranding to Marella Cruises but will still be part of TUI. A new time-lapse video is doing the rounds on the new addition to the Thomson Cruises fleet.